An apple orchard in your own back door! Growing your own apples can be easy and fun. This light red with red vertical stripes will be a great addition to any apple orchard. Grow bushels of healthy, flavorful apples that can be eaten fresh off the tree. There is nothing better than dried apple pies or hot apple pie and ice cream. Remember you grandmother's fresh apple bunt cake? Not only are you saving money but you are getting fresh fruit from you own apple trees. 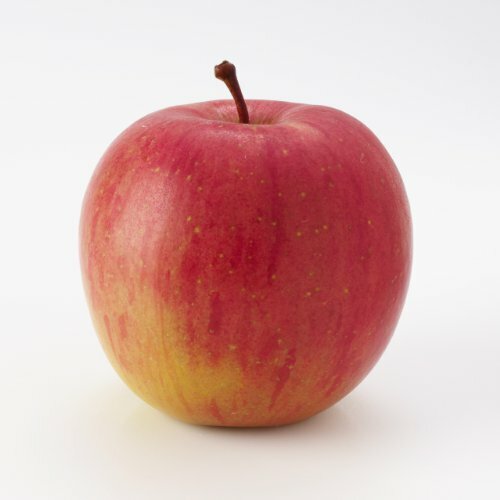 The Fuji apples are known for their sugary sweet flavor. Fuji apples are a cross of two American varieties, the Red Delicious and the Virginia Ralls Janet. This apple was named after the scared mountain Mount Fuji. The apple tree is self-pollinating. The fruit will be ready to harvest in mid-October. Fuji apples contain vitamin A and C as well traces of folate and potassium. Pruning is so important to young trees to encourage fruit production. The best time to prune is December to February. Plant in full sun and best when planted in well-drained, loamy soil. Purchase a 2-3 ft Fuji Apple tree. Fuji Delicious is known for its sugary sweet flavor. This apple is a cross between Red Delicious and the Virginia Ralls Janet. Medium to large light red fruit ready to harvest in late Septembaer. Apples are great in so many dishes, such as pies, jelly and so many more. A great apple for fresh eating, and the kids will love it as a snack.